I see sometimes that resistors are specified as current-limiting resistors, so I decided to see if voltage-limiting ones exist. When I do a search though, I don't see anything mentioning voltage-limiting resistors. A voltage source is theoretically capable of supplying an infinite current into a short circuit hence if a series resistor is used then that short circuit current becomes amps or milliamps rather than infinite amps. A current source, on the other hand, will not be affected by a series resistor at all - it will continue to produce whatever voltage is needed into an "open circuit" resorting to making a sustained electrical arc to create a conductive path if necessary. In these circumstances a parallel resistor will restrict the open circuit voltage because it will conduct the current back to the other terminal of the current source. 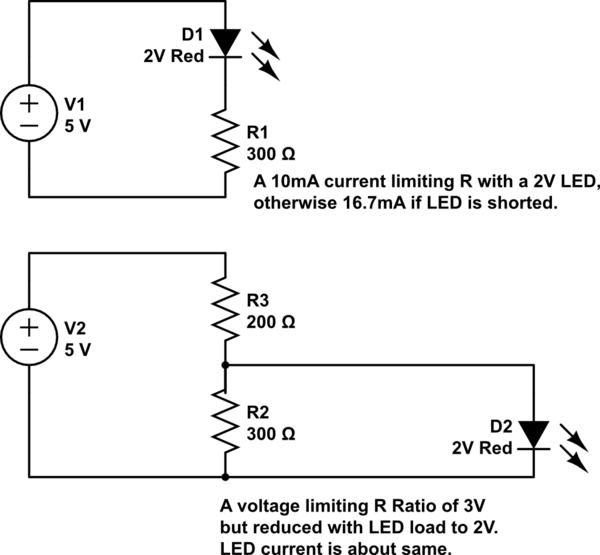 So, in short, a resistor can be a voltage limiting AND a current limiting device. They are not specified as such i.e. a resistor isn't to be regarded as a current limiting resistor rather, it is the function it plays in the target circuit that may be described as "current limiting". If you mean a polyfuse , then there is no voltage limiting R.
These have a large PTC ( positive tempco.) that rises in R exponentially past the holding current, causing a rapid rise in junction temperature from 120 to 140’C where current is limited by a design limit. These have a cold (25’C) resistance rating as well. The opposite temperature characteristic is a large NTC which drops in R rapidly as it heats up. These are used as inrush current limiters called ICL’s and also have a cold and hot resistance ratings with corresponding current ratings. Both are metal oxide components but with a different mix of conductive particles in a ceramic composition. Voltage limiters are semiconductive such as; TVS, MOV, Zeners and diodes. These cannot substitute as a fixed R value but do have some high leakage resistance that changes with many factors such as temperature. Not the answer you're looking for? Browse other questions tagged resistors or ask your own question. At what current and voltage do typical resistors explode? What is the significance of 75mV in available 100A current shunt resistors? resistors misconception - is current-limiting effect circuit-wide?